Holy Buckminster Fuller! Is that a dome on the surface of Mars? 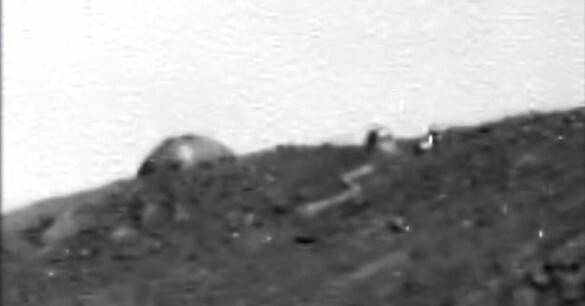 A photograph taken by the Opportunity Rover shows what appears to be a dome or dome-topped structure on the Martian surface. Is it real? What is it made of? Does this mean Martians have a football team? The pictures were taken on Sol 4073 (Martian Day 4073 or 2015-07-10 UTC on Earth) by the Opportunity rover’s panoramic camera (Pancam). The structure is easy to spot as it sits forward on a hill and is the largest raised formation in the area. Its isolation and surface – which appears to be different than the surrounding rocks and soil – makes it look like it doesn’t belong in the natural layout of the area. If it’s not natural, what is it? A glow or light in the middle of the dome suggests it may be metallic and reflecting sunlight. Or it could be a window emitting internal light. If it is indeed a domed building, a smaller formation to the right of the dome could be a storage facility or living quarters. While this seems to be the first dome found on Mars, other have been discovered on the surface of the Moon. These so-called “lunar domes” are thought to be the result of ancient eruptions that formed shield volcanoes which are relatively flat and wide. In overhead photos, they appear to be glass domes, which leads some to believe they’re not natural but made by humans or past lunar residents. The Martian dome is higher than the typical lunar dome or shield volcano on the Moon or Earth. Was it made by humans? There are many who believe that humans have visited and even lived on Mars. Was it made by another species? If so, why have we found only one? Could it be a scouting outpost? What do you think this Martian dome discovered by the Opportunity rover is? Unusual rock formation? Optical illusion, possibly of another hill or mountain behind the hill? Human or alien-made structure? Something else? Is this what it once looked like?